Blessings can be found in having your ministry husband work a full-time job! Two articles I wrote previously focused on problem-solving some of the dynamics that go along with a ministry husband who works full-time. Those were the “Help!” articles, in contrast, let’s look together at the beneficial side of being a bi-vocational pastor or part-time ministry staff. You both can understand the average church member’s life experiences and time restraints. The mindset of church members when your work schedule fills a large portion of your daily timetable. Why some people are hesitant to volunteer their time when their schedule is already full and they’re trying to maintain family life. Why marriages and parenting can suffer. The investment and sacrifices many families make when they volunteer in your ministries. Why some families struggle with some aspects of their ministry responsibilities. The reason people are late or show up to church in work clothes. Taxation on the mind and body from being exposed to sin in the world. The allure to skip church by resting or being spiritually lazy when off work. You are conscious of the mission field when your husband works in it. Your husband is a walking missionary who goes out into your community every day and has opportunities to interact with others for Christ. We have personally seen this in our ministry experience also. If nothing else, a job can keep the spiritual need of souls real in the heart. Last year my husband led a co-worker to Christ through an in-home Bible Study we did with her. This was a particularly special blessing to us since we had not seen anyone besides our daughter saved since we moved to our current city. It was a confirmation to us that living a bi-vocational ministry life is purposeful if God has us doing it. You can value your church and home more highly as a haven. The value of an earthly “Haven of Rest” both at home and in church is priceless. When you are dealing with people in the workplace and community it can wear down on the soul and spirit. Coming home to a peaceful place where God’s love abides is a refreshing taste of heaven on Earth. When a saved person can also walk into the doors of their church and fellowship with other believers it is also a comfort to a weary soul. Remember though Ministry Mamas, you have to be the keeper of your home and make it a haven for this to be true for your life! If you’re not regularly maintaining a clean home and teaching your children to help with responsibilities. Clutter and messes can cause stress, for me personally a visually pleasing atmosphere is neat and tidy. You also need to be maintaining a respectful and servant spirit toward your husband and teaching your children to have peace with one another. Fighting and arguing are opposites of peace. Creating a haven takes an investment of time, teaching, and training to be able to create the atmosphere of rest. You see God fulfill your needs in many ways when you have to trust Him. You can witness how ministry experience can affect people in your husband’s workplace and in the community as he ministers while at work. We know many men whose involvement in their workplace, not just with co-workers, but with seeing the needs of the local people gave them a greater burden for their community. As a result, a more focused concentration was made in reaching those people during their time after work. 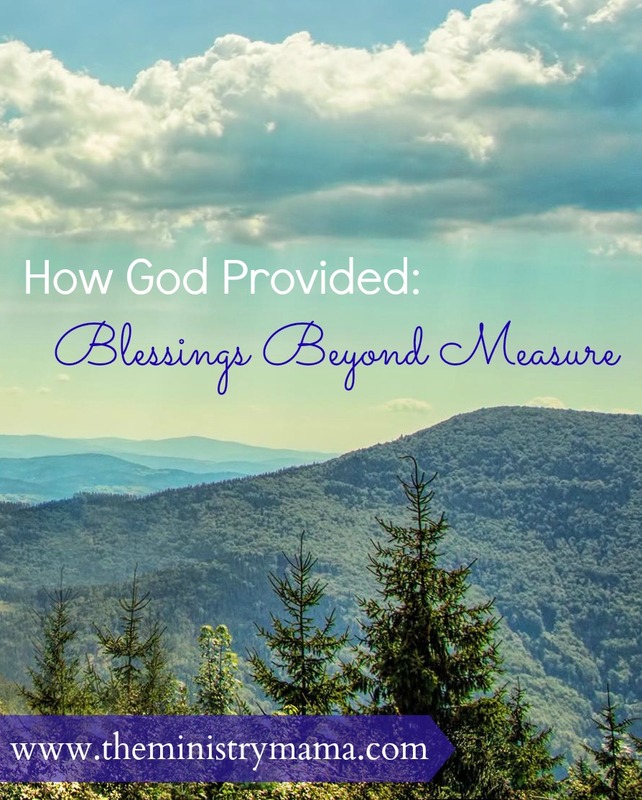 If you are a bi-vocational family it’s easy to the see the negatives of a full-schedule, balancing family time, and regular church work but I encourage you to see the blessings in your life because of what God is allowing. Everything may not be what you wish that it was but there are still plans, purposes, nuggets of rich blessings straight from to be able to glean from this experience. My hope is that you have been encouraged by the viewpoints of many other families who are in similar life situations. Do you ever have weeks where you are pinching pennies and wondering how God is going to come through to provide your needs for you? We had just one of those weeks not long ago and I think God just wanted to comfort me in ways to tell me that He loves our family and that He’s taking care of things in His own way. One of the last times I wrote about God giving me my filing cabinet, I told you about how God will answer older prayers and will give you the desires of your heart that you were not even thinking of anymore. In this particular instance that I am going to write about God gave us things that we had not even prayed for or asked Him about. He just rained down blessings beyond measure in our lives, we are so blessed! During the week I’m talking about we had enough food to last us through the week, the bills were paid, we just were not going to be able to do anything extra. On this particular week, our church held a western-themed revival and almost every night we came home with a blessing. On Sunday we had a big “free” church meal with our church family and on Sunday night a lady gave me a pink cowgirl hat to wear. On Tuesday we were handed an extra-large bag of homegrown bell peppers. Wednesday night, we were given two music CD’s of the music group we had in for our revival. On Thursday, we were given a new-to-us table and chairs from an elderly lady that was a friend of a church member. It was an upgrade greater than we would have bought for ourselves. On Friday, they picked up a hutch from the same lady and brought home two more chairs for the table. On Saturday, toys and games for the kids from my husband’s grandparents who came through for a visit. Sunday, a handful of cash for our upcoming vacation was handed to us. When all the things started to add up through the week, it began to become very humbling. God orchestrated each gift for us in a special way. My husband and I have never forgotten a quote we heard from a preacher during chapel in college, “When you give all you’ve got to God, you’ll never go without.” That week God was not just giving us means to live, He was giving us the sprinkles on top too! So many ministry people out there wondering does God even listen? Does He care? Does He hear my cries? Because they feel like they are giving it all they’ve got to God in their home, family, and ministry and they feel like they have nothing left. The answer is: Yes! He knows how to bless us abundantly in special ways to make us feel like the song lyrics say, like you were His only child. You can listen to these sweet girls sing a part of the song “He Loves Me Like I Was His Only Child,” in the link below. God never uses the same tactics, He likes to bless us unexpectedly as much as He will answer us in the matters that are expected. He is a wonderful Father! Sometimes we may feel that He is running late but His blessings and helps are always in His perfect timing. If you serve Him, He does not leave you alone on the path. When you have only the money in the jar on your bedroom dresser, He will show you in a special way that you are like “His only child.” He is an ultimate provider in physical, spiritual, and emotional needs. You will have weeks where you feel like God withholds His blessings and you cannot see through the clouds that have settled down on your pathway of life. Other weeks God will shovel blessings you were never expecting down into your life that will make you realize how He never did leave you or forsake you. He was loving you all along and these blessings are going to be meat for your heart to help you carry you through those cloudy times in your life when He may be silent. If we added up all the blessings beyond measure that God has given us throughout our lifetime, it would blow our minds! Have you seen the Lord work in your life this week or last? What memorable piles of blessings can you remember that God gave you in the past? Have you thanked Him for those things? The blessings beyond measure are more than material, they are even spiritual things that I have not mentioned specifically here. With God as our Father we have a wonderful life. Luke 6:38 Give, and it shall be given unto you; good measure, pressed down, and shaken together, and running over, shall men give into your bosom. For with the same measure that ye mete withal it shall be measured to you again. P.S. Remember, when you give it all you’ve got to God, you’ll never go without! John the Baptist was going through personal difficulties after his active ministry was put to an abrupt stop when he confronted Herod about his infidelity. Herod in turn arrested John. There is no proof of what type of imprisonment he suffered, whether it was house arrest or in a dungeon, but we do know that he was isolated in a place where he could not longer view the works of Christ. In the last article we discussed Part 1 of Christ’s response to John the Baptist’s heavy question, which included them taking the good news of the works of He was doing outside John’s imprisonment. These answers can be found in Matthew 11. The second part, includes a blessing with a condition. Offended according to the Strong’s Concordance comes from the Greek word skandalizo. Jesus encouraged John not to distrust or desert Him. Please do not allow yourself to be offended by how God is working outside of your situation. It is not about whether He loves you or not, because He does, it is about your choice not to become offended. Our difficulties in ministry and this life will come (Matthew 18:7), but Christ’s desire is that you do not become offended by them. Nothing should stand in our way to make us distrust or desert our Saviour. Many of us are familiar with Paul’s writings and about the deserter, Demas, although it does not specifically say that he was offended in Christ, he left God’s work to follow after worldly desires. (Read about Demas in Colossians 4:14, Philemon 1:24, and 2 Timothy 4:10.) Our offenses, if not properly managed with Biblical answers, will lead us away from our ministry and calling to find earthly comfort apart from God’s will for our lives. Guard your heart to keep your heart from wandering. We do not want to have shallow roots enduring only until the persecutions and trials come into our lives, deserting God. Even though some pruning may happen in our lives we should strive to be the person whose heart is good fruitful ground. THINK ABOUT THIS: Your present discouragement or doubt can be only as temporary as you will let it be. There is joy when you are able to rejoice with those who rejoice. There is maturity when you can look beyond the bars of your jail cell and understand that hope really does exist beyond this situation and this life because we are blessed if we do not become offended. God allows us to choose fruitfulness. John the Baptist’s end was going to be an unexpected death at the hands of wicked women, calling for him to be beheaded and his head to be brought before Herodias and her daughter. The Bible does not say what John the Baptist’s emotional status was before the beheading. I hope that as he received Christ’s personal message to him from his disciples, that he rallied with hope for eternity and for the souls of the people in the world who would believe and repent on Jesus. I hope he made the choice not to become offended and chose the blessings of God. Choosing not to be offended is not easy. It means it will take forgiveness. It means you will have to choose to be a blessing even when you may not feel like it. It means you may have to go the extra mile or strive to the peacemaker. It means you have the freedom to choose to love God, like Job, no matter what. It means you may have to overcome fears or walk away from hopeful expectations. It means that doors may be shut as you wait for the next one to open. It means you must be a living sacrifice, laying down yourself so you can receive God’s blessings. Our God loves us more than we can imagine, but yet so often we forsake him like the disciples did that day of His crucifixion. We do not have to add to our own sorrow by adding offense to our situation. When you do not understand or you can see clearly the reason for your discouragement and doubt, love the Lord and desire to seek His face and know His presence. You will be all the better for it because God is fashioning you into the image of His Son. Be confident in God’s workings in your life even if you cannot see the light at the end of the tunnel because, if you’re still here then God’s still performing His work in you. Pastor Appreciation: 10 Ways to Say it with Cake! Enter your e-mail address and get The Ministry Mama's latest and greatest.